Both real and artificial trees can and do burn causing fire damage; unfortunately, ‘tis the season. As expected, Christmas tree claims arise through the seasonal months of November, December, and January. 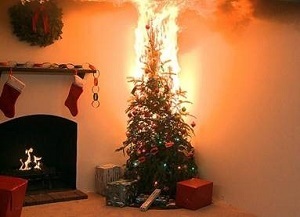 The National Fire Protection Association (NFPA) estimates of reported home structure fires, derived from the U.S. Fire Administration’s National Fire Incident Reporting System (NFIRS) and NFPA’s annual fire department experience survey show that in 2009-2013, Christmas trees were the item first ignited in an estimated average of 210 reported home structure fires per year, resulting in an annual average of $17.5 million in direct property damage. Just this week, a fire destroyed a 96 foot white fir Christmas tree at a mall in Costa Mesa, California on December 14, 2015. The tree with twenty-thousand lights had been displayed and lit since November 23, 2015. The property damages will be significant. A dry Christmas tree can become fully engulfed in flames seconds after first being ignited. The U.S. Consumer Product Safety Commission released a video demonstrating the fast rate at which a tree can burn and cause property damage. In the video, a Christmas tree is in flames within 10 seconds, the fire spreads to the ceiling and furniture within 30 seconds, and the location of the tree is entirely engulfed in the flames within 40 seconds. The rate at which the trees burn will depend on the use of fire retardant, use of other chemical materials on the tree, dryness of the real cut tree, location and environment of the tree, species of the real tree, manufacturer of the artificial tree, etc. • Use holiday decorations made with flame-retardant or non-combustible materials. • Carefully inspect light strings and replace damaged items before plugging lights in. • Do not overload extension cords. • Turn off all light strings and decorations before leaving home or going to bed. • Never use lit candles to decorate a tree, and make sure any lit candles in the room are placed away from tree branches. • Water daily live trees. A live tree can absorb as much as a quart of water a day. A moist tree is less of a fire hazard than a dry tree shedding needles. Use 1 quart of water for every inch of tree stem diameter. • Make sure the tree is at least three feet away from any heat source like fireplaces, radiators, heaters, candles, heat vents or lights. How long has the tree been in the house or building? What was the watering schedule? Where did the insured obtain the tree? Can we determine how long ago the tree was cut? Did the Christmas tree seller provide a fresh cut and well watered tree? What type of lights and other decorations were used on or near the tree? What was the cause of the fire? Was the tree protected with fire retardant? For artificial trees, the following additional claim investigation questions will arise: When did the insured purchase the tree? What is the make, model, age, seller of the tree? How was the tree kept, stored, displayed, etc.? Potential subrogation targets would include the manufacturer of the electrical device that caused the fire, a person who negligently left a candle burning nearby, a person who negligently discarded a cigarette nearby, etc. An additional potential subrogation target in an artificial tree case would be the manufacturer of the artificial tree itself. As a contributing factor, the Christmas tree seller may be liable for selling an aged and/or dehydrated tree without proper warning; however, the evidence needed to proof this claim may be difficult to obtain due to the nature of the Christmas tree industry (brevity of the season, large volume of trees, lack of documentation and tracking of individual trees, etc.). Also, the insured may have been required to have the common knowledge that a dry Christmas tree will need additional watering or assume the risk of purchasing a dry tree. Another potential target or contributing factor may be the watering service company for failing to properly and routinely keep the tree watered. Depending on what a fire investigator can determine, another potential target may be the fire retardant company for product defect. The fire retardant may have worked as properly as expected (i.e., delay a fire from consuming the entire tree or resist a small flame), or may have caused the fire to burn larger or faster due to a defect. The expert investigation would be key for this type of claim. In this ode we do not praise such fire losses, but hope to inspire holiday safety, fire safety preparedness, claim preparation, and thorough investigation.